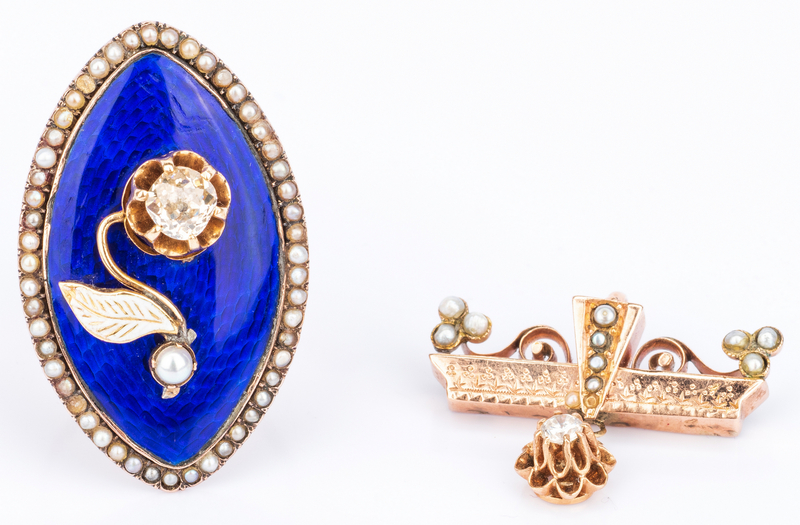 Group 5 vintage fine jewelry items. 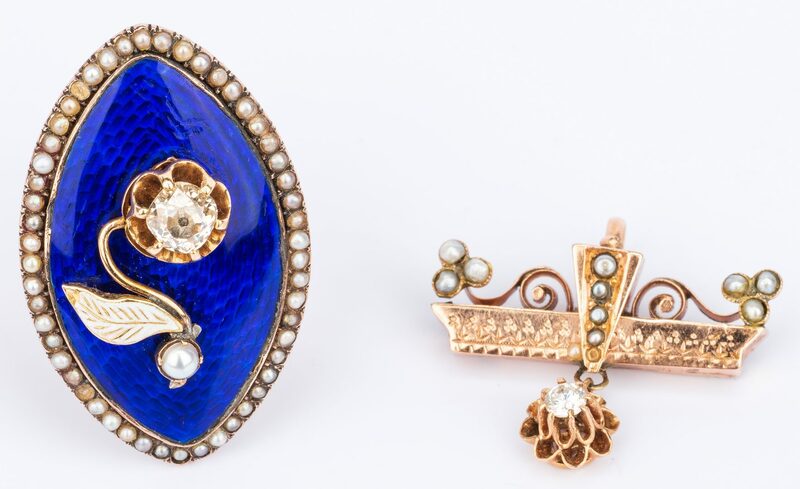 1st item: Victorian diamond and enamel ring, in a navette shaped, 10K yellow gold mounting; central blue enamel plaque surmounted with a floral spray, containing one prong-set rose cut diamond weighing approximately .50 ct. (I-J, SI) with white enamel leaf and seed pearl bulb, all framed by seed pearls, ring top: 1-5/8" H x 7/8" W; ring size approx. 6-1/2. 9 grams. 2nd item: 14K white gold filligree bar pin with 3 round brilliant diamonds with total weight of approx. .30 ct and 4 trilliant cut sapphires, 2-3/8" L, 4.3 grams. 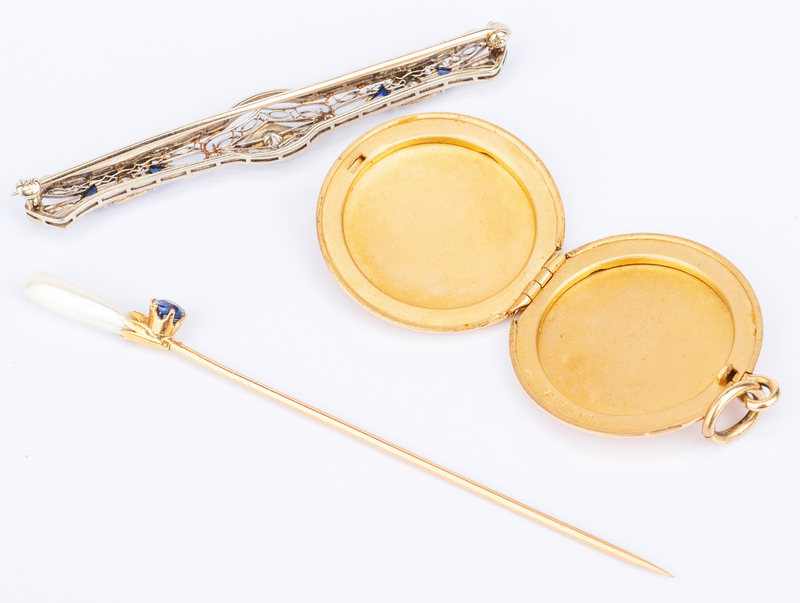 3rd item: 14K yellow gold round hinged locket with florentine design on front, 1-1/8" diameter, 10.3 grams. 4th item: 14K yellow gold pendant with seed pearls and CZ stone drop, 3/4" L x 1-1/8" W, 1/4" bale, 3.4 grams. 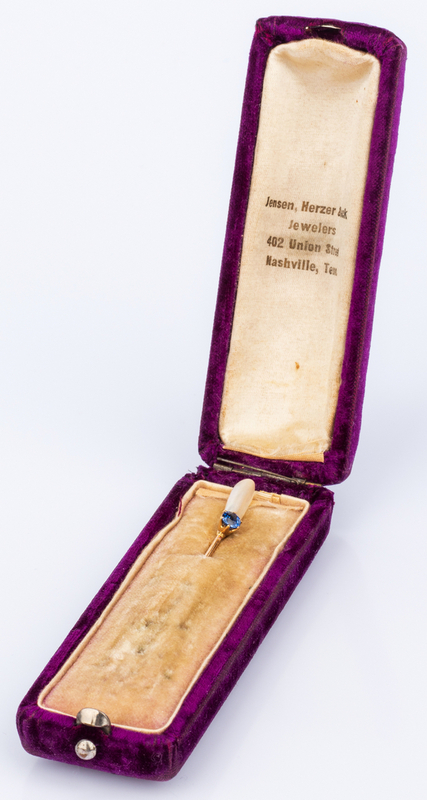 5th item: 14K stick pin with freshwater pearl end and blue stone, 3-5/8" L, 1.8 grams. 10K: 9 grams; 14K: 19.8 grams. CONDITION: Minor surface wear to all gold mountings. 1st item: Tip of white enamel missing and few scattered surface scratches to blue enamel background. 2nd item: Small chip to one trilliant sapphire.